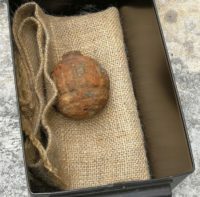 A World War I hand grenade found a perfect disguise in a shipment of potatoes sent to a Hong Kong chip factory. The potatoes were harvested in France where for four years artillery rained down on the fields of the Western Front in brutally futile attempts to gain a few inches of ground. Unexploded ordnance from the First World War is regularly churned up during agricultural work. This one was of German manufacture, weighs two pounds and is three inches in diameter, so the dimensions of a potato but much heavier. According to military historian Dave Macri, the field where the potatoes were harvested was believed to contain a trench during the first world war. “If it was covered in mud, the grenade was likely to have been left behind, dropped by soldiers there during the war, or left there after it was thrown [by enemies]. Whatever machine digs up potatoes for the global market can’t tell the difference between a bomb and a bomb-shaped root vegetable, so it went on its merry way to Hong Kong. By some stroke of luck, none of the jostling, conveying, dumping and stevedoring it experienced on its long journey woke it up from its long slumber. It was only when it arrived at Calbee Four Seas Company’s chip factory that its sorting machines detected that one of the potatoes was actually a bomb caked in rust and mud. The University of Hong Kong professor said the grenade could still be dangerous even if it was not triggered. “If you’re standing close, within five feet, you could get wounded or even killed [if the device somehow went off], but it’s not the kind of thing that can bring down a whole building. “But chances are, the weapon was never armed because to ignite it, you have to withdraw the safety pin and release a lever. And since it didn’t go off, it was probably never triggered,” Macri added. Hong Kong firefighters and police were called in to disable and remove the device safely. On Saturday, explosive experts used a high-pressure water firing technique to detonate the grenade outside the factory. They did us the courtesy of recording the event. This entry was posted on Monday, February 4th, 2019 at 8:40 PM	and is filed under Modern(ish). You can follow any responses to this entry through the RSS 2.0 feed. You can skip to the end and leave a response. Pinging is currently not allowed. Since most of France his been fought over so many times in the gunpowder era, finding unexploded ordinance is actually quite common, even back to the Napoleonic age. Farmers regularly turn this stuff up, and dump it by the roadside for explosives disposal teams to deal with. Occasionally it goes off with tragic results, and even some of the disposal experts have fallen victim. Not surprisingly, the Brits and the Germans regularly find stuff too, especially aerial bombs, but smaller ordinance turns up during construction, in fishing nets, is found by metal detectorists, or occasionally is found in someone’s basement or attic. Such stories regularly appear on BBC news. Our friends in Europe are still paying the price for past generations’ inability to get along peacefully. Even here in the US, live Civil War ordinance sometimes is discovered. About 30 years ago construction crews clearing land for a shopping center here in Charlottesville turned up a live artillery shell left from a minor skirmish grandly known as “The Battle of Charlottesville”. The shell was detonated by military experts. Nice bang in the video. My compliments to the Hong Kong disposal experts. That’s a “potato” of high-energy value! Well…was. From December 2018: At the Belgian Army’s Explosive Ordnance Disposal Service barracks, Adjutant Rob Nollet shows me crates of projectiles – some containing poison gases – dug up over the past week. He says: “There were 1.5 billion projectiles fired in the First World War, and many fired in this area. I don’t believe this work will ever be completely finished, certainly not in my lifetime. “Sometimes in one field we will find thousands of shells. We have come across huge ammunition dumps where the armies stored their shells which were then abandoned as they retreated.” A squad of nearly 200 bomb disposal experts receives at least 10 calls a day from local residents who have spotted ammunition in the soil. Caked in mud, many of the British, German and French shells that the soldiers bring back are still live and dealt with safely in controlled explosions at this base. Last year the team made safe more than 250 tons of munitions originally unleashed during the offensives that once raged across Flanders’ fields. In Belgium, they refer to this deadly hoard carefully tilled from the forever tarnished soil as the “iron harvest”. I spent a couple of years in Flanders, Berlin and Bavaria. As far as Flanders is concerned, WWI ‘harvest’ unfortunately is still a lot. The parts of Bavaria that I know seem to be clean (there was one WWII detonation in Munich, a couple of years ago) while Berlin and its surroundings are still scattered with explosives (of the blockbusting type). In Bavaria and Austria out in the wilderness bombs occasionally and spontaneously detonate, though. –It happens. Moreover, and coming to think of it while writing this: In 1943/44 a family member was active in defusing, and last year I was presented his handwritten records of 240 defused bombs. One was unsuccessful with no one harmed, but he detonated with his very first bomb (I knew about the incident, but not that is what the very first one). 7 had been killed in that accident, but he himself fell behind a bit of sand. A court martial procedure was endured, a written statement of which was included, and to each and every single one of the 240 bombs, the address, the type of fuse, the load and additional comments were painstakingly taken notes of. Here, from 2012, the WWII one that was detonated in Munich. I personally cannot tell what had triggered the decision to actually blow this one up, but there certainly was a reason. My guess is that this is one of the smaller ones. Doesnt seem to be much quality control in place! And I dont know anything about it but seems funny, Hong Kong buying potatoes from France ?? A friend and neighbour of ours found a German incendiary bomb in his garden shed. Presumably an earlier occupant didn’t want it lying about in the garden and moved it while he considered what to do with it.